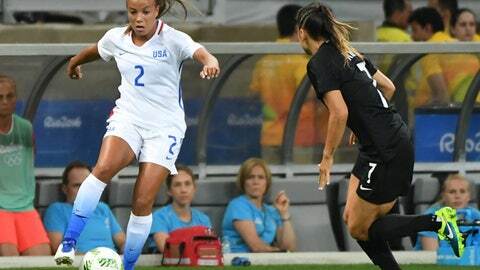 Sometimes 18-year-old Mallory Pugh watched her friends work at places like Papa Murphy’s pizza shop and Steve Madden’s shoe store after school or over the summer with a tiny smidgen of jealousy. "All my friends have had jobs and they’ve always had spending money they could use for the movies, and I had to, like, do chores at home," Pugh said with a laugh. A first job is a rite of passage for many teenagers — a first taste of adulthood and independence. But the thing is, Pugh has been way too busy traveling the world and playing soccer to get a job like most of her friends have. For a while, it was for the youth national teams, but right now, it’s in Brazil at the Olympics, where the U.S. women’s national team is trying to go for its fourth consecutive gold medal. Pugh is not simply along for the ride. The Denver-area native started for the U.S. in its match against New Zealand, making her the youngest player to ever start for the team in an Olympics. Against Colombia on Tuesday, she scored a goal, becoming the team’s youngest goal-scorer in an Olympics, too. She’s the real deal, but her quick rise took even her by surprise. "I didn’t think that it’d happen this soon, but I definitely thought that this was something I wanted to do when I’m old and have a job." As a 16-year-old, she went straight from the U.S. Under-17 team to the U-20s — bypassing the 18 and 19 age groups — before quickly being spotted by coach Jill Ellis. She made her debut for the full U.S. team in a friendly against Ireland on Jan. 23, when she was 17 years and 269 days old. 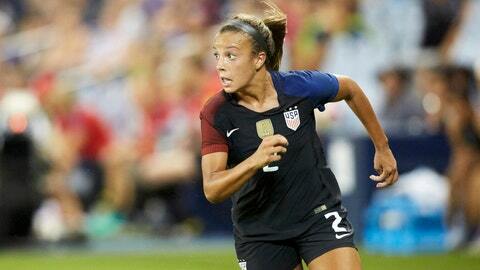 She scored in that match and was the youngest player to debut for the U.S. team in 11 years. While her age is part of what makes her playing ability so impressive, her play stands on its own. It’s a common sight to see Pugh taking on defenders with the ball at her feet and then threading an inch-perfect pass to one of her teammates. She exudes confidence, smart decision-making and maturity on the pitch that seem well beyond her years. The goal she scored against Colombia — which would turn out to be crucial in preventing a loss — was a sparkling yet quintessential individual effort. She dribbled through the length of the box to get past some defenders, swiveled her body around and fired through a gap in the Colombia defense into the net. It was her first goal in a major tournament, but she was unfazed by the stakes of it all. "I was just doing whatever I could to help the team," she said in the mixed zone afterward, almost with a shrug. Of course, Pugh has been scoring impressive goals since she first joined the team eight months ago. It’s not exactly new, even if she is now doing it on a bigger stage than she ever has before. "She’s a game-changer," said captain defender Becky Sauerbrunn on Tuesday from Brazil. "She just gets it and it’s wonderful to have a player that young who just understands the game and is able to do the things that she is able to do." At 18 years old, Pugh can sometimes make her teammates feel a little, well, old. She was born in 1998, which means she wasn’t old enough to watch the famous "99ers" team that won the Women’s World Cup in 1999 and has so often been cited as an influence for young players. Pugh truly marks a new generation in the USWNT. But it can lead to some funny moments and missed cultural references sometimes, like when teammate Lindsey Horan told her a story that included a mention of the late 1990s/early 2000s boy band ‘N Sync. Pugh’s reaction to the story: "Who is ‘N Sync?" "I knew the song ‘Bye, Bye, Bye’ but I thought it was sung by the Backstreet Boys," Pugh later told FOX Soccer, recalling the incident. "No one in my house grew up in that age group. We’re ’90s babies, so I just think it’s funny." When Pugh was finishing high school earlier this year, her teammates — who are all past typical college age — helped her with homework from time to time. And when Pugh was deciding whether to go professional as a soccer player straight out of high school or enroll in college, she turned to her teammates, too. Weighing interest from clubs and college scholarship offers, Pugh settled on attending UCLA, which she has deferred until January. She spoke to a lot of people about her decision, including 22-year-old Horan, who became the first American woman to go pro straight out of high school when she signed with Paris Saint-Germain in France and skipped college. "I talked to Lindsey a lot about it and I really appreciated her support with it. She really helped me decide," Pugh said. "She went through the same thing and I know she wanted the best for me, not just what everyone else thought." Horan now plays for the Portland Thorns, which happens to be a team that has pursued signing Pugh straight out of high school and made trades to move up in the NWSL allocation order to get her. Merritt Paulson, the owner of the Thorns, has been open about the club’s interest on social media and, as recently as Tuesday, he responded to a fan on Twitter saying he supported Pugh’s decision to go to college and added, "She is really good." Back in January, he told reporters on Twitter he hoped she would change her mind — he later deleted the tweets as he usually does after conversations with fans and reporters. Pugh said she does plan to play as a professional after college, but she hasn’t thought far enough ahead to know what that looks like. Asked why she chose to go to college, Pugh said it was just something about UCLA. "When I visited UCLA, I just kind of fell in love with the place," Pugh said. "Having that feeling for so long, it really excited me and it still does." But first, before she plays her first college game or her first professional game, Pugh has a medal to try and win at the Olympics. The all-important knockout round for the USWNT begins today against Sweden, where there’s a good chance to see Pugh get significant minutes. It’s what Pugh has been training for since before the team left the U.S. for Brazil. "Just yesterday at training, we were going over our set pieces," Pugh said before the tournament began. "It was so sharp and so good, it gave me the chills. I was like, ‘Dang, everyone around me is ready so I need to make sure I’m ready.’ "
So far, it sure seems like she is ready — not just for the 2016 Olympics, but to become the newest star of American soccer.